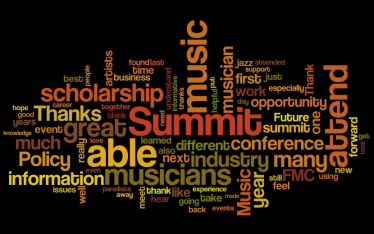 As we prepare for this year’s Policy Summit (October 27-28, 2014), we found ourselves looking at some reports from past Summits and rediscovered some rave reviews from past attendees that might help you better understand what you will get out of attending this year’s event. In a nutshell: attendees gain knowledge, inspiration, ideas, new friends and contacts, stronger community, and better understand why it’s so important that everyone working in music today knows how national policy affects how money is made—and how you can make sure your voice is heard! Convinced? Check out this year’s schedule, register, and we’ll see you in DC! And if you register by October 23rd, you’ll save $50 off the day-of price ($299) or attend for one day for $149. If you’re a musician or student, apply for a scholarship by October 20th and attend both days for $25!